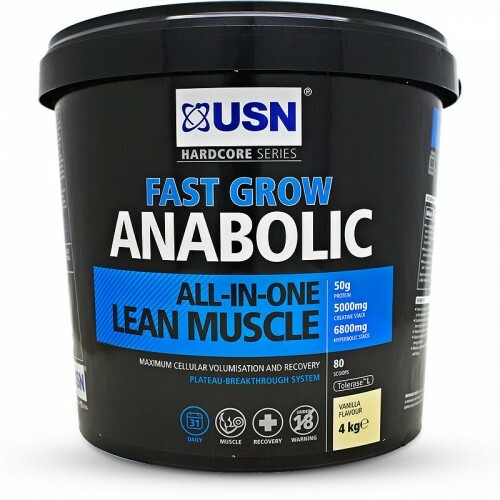 USN Fast Grow Anabolic has been created for those looking to building lean muscle rapidly. To help with lean muscle growth each serving has 50 grams of quality protein. This nutrient is essential to help with the repair and rebuilding of muscles after your workouts. Lifting heavier weights in the gym helps increase lean muscle. Five grams of Creatine Monohydrate and CEE give more strength during explosive exercises like weight training and shorten recovery down between sets. Improved recovery creates more intense training with you performing constantly with each workout. This mass gainer contains all you need to help you reach your fitness goal. No need to buy 2 or even 3 separate products, this has it all. A precise blend of protein from Whey Protein Concentrate and Isolate, Calcium Caseinate and Soy Protein Isolate has been added to give you the benefits from different protein sources. To increase muscle you need a certain amount of carbohydrates to help deliver nutrients around your body. A carb blend of maltodextrin and dextrose monohydrate help with the replenishment of this muscle gain nutrient which may have been emptied during training. With the blend of proteins, added Creatine and Tribulus Terrestris for optimal natural testosterone levels Fast Grow Anabolic is a complete mass gainer for lean muscle. * % Nutrient Reference Values (NRVs) for individuals 4 years and older (2010). 2-Stage Glyco-Matrix Carb System (Maltodextrin & Dextrose Monohydrate), 4-Stage Anabolic Protein Matrix (Whey Protein Concentrate & Isolate, Calcium Caseinate, Soy Protein Isolate), Cocoa Powder (Only in Choc variant), L-glycine, Creatine Stack (Creatine Monohydrate & Creatine Ethyl Ester), Stabilizers, Flavouring, Taurine, MCT Oil [Medium Chain Triglyceride vegetable oil (from coconut fruit)], Sodium Chloride, Anti-caking Agent (Only in strawberry variant), Calcium Phosphate, Non-Nutritive Sweetener Blend (Sucralose, Acesulfame-K), Tribulus Terrestris extract, Potassium Chloride, Vitamin Premix, ToleraseTM L (pH-stable lactase), Chromium Picolinate, Colourants (Only in strawberry variant). Allergen Warning: Cow's milk and Soy. Manufactured in a facility that also processes barley (gluten). Contains lactose, but regarded as suitable for lactose intolerant individuals due to the addition of lactase enzymes. Ingredients may contain traces of tree nuts, peanuts and crustaceans. • As a nutritional supplement, add 3 scoops to 600-650ml of cold water. • Use a blender or hand held shaker for about 30 seconds. • Have 1 to 2 servings daily as snacks in-between meals. • Ideally between breakfast and lunch, lunch and dinner. • The servings may be halved. • Due to the creatine in the product, use it for no more than 12 weeks. • After 12 weeks take a break of 2 – 3 weeks before continuing if your fitness goal has not been reached. This product is a great if you are looking for the most affordable post workout and meal replacement supplement that delivers a high quality protein blend along with a few added extras to boost your growth. However, This is not the best product out there in the market. For the price, this product is an excellent choice for the intermediate level fitness athlete that is on a slight budget. I started off using this product at 98Kgs and with a proper diet and hectic gym sessions for 5-6 days a week, I have dropped to 91Kgs at 16% body fat from 23% body fat in 9-10 months (my weight fluctuates between 88-92Kgs on a daily basis). Diet clean, lift heavy, rep till failure and i would recommend combining this product with some BCAA's for an intra-Workout supplement and also I feel it works best when you train at night and take it after the workout but an hour before dinner. I have just use it for 5 days but hearing good news. I've Used the product for a week and I have gained 8 kgs of lean muscle.. gym twice a day, avoid fatty foods. The taste still needs a bit of working on, the price is too much for an average joe... But nevertheless the results are better than awesome. Would recommend this supplement to anybody who is struggling to pick up or put on some body mass. Good product, good gains. Would recommend for skinnier people attempting to gain mass. I started taking this product when I was 75 kg, am around 84 kg at the moment after about 2 months. I did not hulk up insanely quickly like others but I have been having good lean gains, my legs have responded well and now even my more challenging body parts like chest and arms are coming along. Definitely requires you to gym else you will pile on some weight. I recommend anything with chocolate in it. I have had the plain chocolate, strawberry and chocolate and peanut butter. The strawberry has been my least favourite despite my girlfriend saying its the best tasting of the 3. Price is a bit high, but there are almost no cheap high quality of protein sources so its a bit expected as this product definitely is better than the hyperbolic mass which is much cheaper. I have observed both mass and strength gains but that could also be attributed to me being able to commit harder in the gym. I have abs but they are not popping as my body has a propensity to store fat there, this makes it a bit more difficult to do that as its high in calorie and carbs, experimentation with breaking up servings may be required for optimal results. it works very well for me. i like the chocolate flavor! Gained a substantial amount of weight whilst on this supplement. I tried other mass gainers like Hyperbolic mass and found this one to be more effective. The price is the only downside for me. But would definitely recommend for those interested in gaining lean muscle. Could not get to like the Vanilla taste. The taste is okay when you start drinking but towards finishing it, it's terrible . I drink it in the morning after my gym session. I doesn't give me only the mass it also shred me... and hey it doesn't hurt in the bedroom. I'm very happy with the results. Best and cheapest. I've been using it for about a week now and I'm loving it...I can see the difference already and I can workout longer than before. I trained twice a day while using this product, after two weeks everyone's been telling me that I'm getting bigger. Best supplement in the market for me. its good but to much suger, n makes my <<stomach runnin.>>, but people are seeing result on me. Next day Repeat. You will gain. Im really impressed with this product. On a whim i decided to give it a try after struggling to make much gains in the past. I have been using it for about a month and i have seen a considerable difference in mass and definition. Like others have said you have to be disciplined with your routine or it will naturally not work for u. Im excited to see what the results will be after 6 months. I would advise on paying attention to your macros This is very high in carbs and some sugars so bear that in mind when u implement this into your daily food intake. Good product for hard gainers! One of the only mass gainers that's actually worked for me. The taste is very average and the consistency is thick, which makes it very difficult to get a full serving down. It also leaves me feeling very full afterwards BUT, its worth it. This is one of the very few products thats actually worked for me. If you're a hard gainer, I definitely recommend Fast Grow Anabolic. Not the easiest shake to get down, but in the end, the gains are worth it. I was always a hard gainer and believed in hard work. It seemed impossible to go above 60KG. About a month ago I started using Anabolic fast grow and now I am 67KG. If I keep on gaining like I am now. I will compete soon too. Moved from Hyperbolic All in One Mass Gainer. So far, Happy and Hard Gut and Core Strength is on the up. How about a sponsor USN ? I have gained 3kg in two weeks by taking 1 serving per day split in two, also I feel the extra strength boost in the gym. I recommend this product to anyone that wants to look good and stacked within 12 months. Great taste especially strawberry, if you want size it's gonna give you but can be expensive. fast grow is good i've used it for 2months have gain a lot of muscle mass.you will not see results from any supplement within weeks. Usn a good not great supplements. But for the price it is - - >10/10 gained 2kg in the month that I used it! Happy with the end results of 2tubs will consider using it in the future cause I'm looking for a lower carb & higher protein shake ! 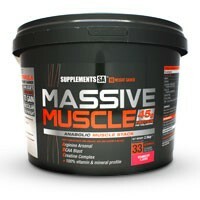 This is a great product, I gained huge mass within a month of using, as well as energy and massive strength. I play football and it gave me a boost to shine because I now cope against big players, it all boils down to only talent now, not power anymore and I come out tops always. I love the new look me, hahaha.. Thanks USN! If u take it before workout with creatine HCL and first thing in the morning. Worked great on me after 3 months I made explosive gains in my body especially my arms. This product is good. In 1week my body it was starting to grow,the taste it is not bad. I like it because it is a complete shake. Don't need to buy other products as this has everything. I don't mind the taste, Chocolate is the best. Got good results using this after 3 months. Worked well for me after a month,got some good results . I've been using this for about three months now and have seen superb improvement. Was on other protein shakes before and didn't see near the same amount of muscle gains. I am a hard gainer and after taking this product twice a day i was happy to see results such growth, increased energy and strength! Taste not good at all but after seeing progress i didn't really mind! Vanilla flavor is horrible ....but works like a bomb ,drink plenty water and u will see results ,put on 3 1/2 kilos in 2 weeks and will continue using it but try strawberry flavor . Great for hard gainers, really helped me out and continues to do so for me. Has a decent amount of protein to boot. Its very thick in texture with a average taste. Pricey but worth it. An ABSOLUTELY DISGUSTING TASTING "CHOCOLATE" flavour - chocolate? not sure what chocolate USN eat! can't comment on effectiveness as given the HORRIBLE "chocolate" flavour, i wont be continuing this product. thats how bad it tastes! and it wasnt cheap. i would rather give my new 4kg tub away than force myself to drink this. it tastes horrible you have to force it down .i have been taken it for 2 days but the results are good. Good product , gave me extra strength but didn't see much result when it can to the rest. Tried a similar product which didn't yield results, this however proved to be much more effective. Will definitely keep on buying this! It gives more satisfying results in relation to the amount of work you put in. Strawberry tastes great and is well worth trying. Ive been using this stuff for a good couple of months now. And its great, i use the USN WHEY after my workouts. And fast grow during the day to replenish my system with proteins!! This product is great and im off to buy my 4th tub next week. this is a great mrp because it has 50g protein per shake and has creatine and testo booster in. I'll recommand this if you don't want to spent much money on all of the supplements. When I started using fast grow in the beginning of my gym career I gained weight very quick. 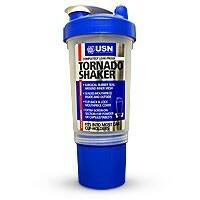 It taste good but is very very thick if use make it as USN recommends. So I used 1 scoop with 500ml water. 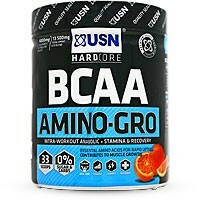 This is a good product but USN have a lot of other products thats better!! Taste good effectiveness is ok and price real good. For what you paying you get a lot out. I used Hyperbolic Mass twice daily and Fast grow Anabolic once daily directly after exercise.... also used BSN N.O Xplode and BSN Cellmass together wit the two USN products.... i gained fast like really fast as i am training off season for Rugby.. i need to put on weight fast i gained about 6kg of rock hard muscle and no fat.... in 2 months... which is great as my bodyfat is still 7% these are great products!!!! 1st week halfed servings Great gains will buy again. As a entry level all round supplement it is really good, however im not a big fan of USN, this price is good and as a first step of using all the basics of the supplement world, you wont be disappointing. VERY important to follow the correct Maximum dosage, dont under dose as it was my mistake as a rookie and it shows(lack of). be sure to move on to bigger and better brands! waste of time and money, better products out their. 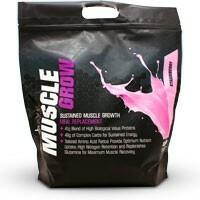 Fast Grow Anabolic is my favourite Mass Gainer. The best part would be the Stack you get in it. Many people don't realise this and compare it directly to a plain protein and Carb MRP. In the end you land up saving because if you take the recommended servings you get your creatine and your tribulus, which is great for bulking up. Two tubs a month and you will feel like the Hulk. Great product. guys all i can say is that subjectively, this product worked! 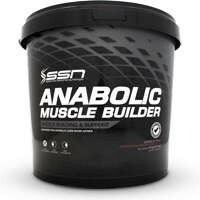 try a 4kg tub! Was quite impressed considering its USN and all the negativity that surrounds the brand, tastes good and had some nice gains. Scoops are large so you use almost a kg in three days, but worth a try. Not great,slow gains,maybe okay for beginners,overall not impressive. 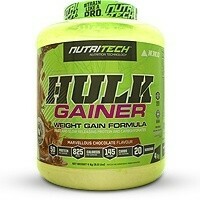 For those of you that are looking for a high protein or mass gainer you should look at a different product. That been said the taste is good, but it dosen't mix well unless you use a blender. It is very thick and goes down very hard especially if you mix 2-3 scoops with milk.You will also feel bloated. It is a good meal replacement though and gives you your protein but you go through it a lot faster than other meal replacements. You will gain a bit of weight but not a lot in contrast to how much of this stuff you must take to make it effective. Tasted terrible, made me gain alot of fat and is extremely expensive. Waste of my money and time. i used a 1 kg and it lasted 5 days...that means i need six kgs per month...thats alot of money! !but must say while using it i was training like a beast.i rate its a great product, i gained 1 kg from it in 5 days! drank 5kg of this stuff... it did nothing. also hard to drink because the texture is so thick. Used this product for 2.5 months, gained 4.3kg. I was so excited as I actually bought something that work...well well, to my surprise, once I stopped using it, I lost 3.6kg even though I followed the same training routine and had a great nutritional plan. gained 4kgs in 1 month with this and doesnt taste too bad just really thick so add a little more water. I have had great gains from this product. I took the full 3 scoop serving (150g), mixed in 200ml extra water (thats all you have to do to stop it from being too thick). I increased my cardio from 45 minutes to 60 minutes per day, and set out a proper 5 day split weight training regime with a well regulated diet.. After 1 month, I have cut my body fat by 3 % and I have gained a total of 4.2kgs. If you are looking to give up gyming this is the product. It tastes terrible and does not mix easily, and, there are no such a thing as "results" with this product. . .I strongly recommend MUSCLE SCIENCE OPTIMUM ANABOLIC over this product. I've gained like 4kg's with this, but most of it was fat..
i used this product for 1 month...i was not so impressed. this stuff tastes great. good bang for buck. seen results in only one months use. people got different tastes so it wont suite alot of people. Tastes really bad and doesn't mix easily.Thick and slimy.I enjoy Muscle Science Optimum Anabolic much more.As for results - nothing considerable.When reading the label on the product one gets really excited but don't be fooled. I really didn't enjoy this product. The consistency was way too thick! It also made me feel ill, with a sore stomach, and bloatedness. The strawberry cream tastes great! Tastes like rubbish, thick and sickening! I definitely did not enjoy it and will never buy it again. Have been counting down the scoops until I am done. As for muscle volume, I haven't seen anything wow about it! P.S. If you want to try it liquidize a banana with it... masks the taste very well!